Detecting Fake Instagram Engagement - Hecktic Media Inc. In our continuing efforts to encourage fruitful relationships between the travel industry and new media, we believe that transparency is of the utmost importance. You want to work with influencers that are professional and are gaining their audience by truthful means, and it’s not always clear how to tell who that is. Back in April, we dove into Facebook stats of some of the top influencers across North America. We noted internally who is doing well and who isn’t, and most importantly, who is abusing the system. And now, we’re doing it again, but this time we are tackling Instagram. And unsurprisingly, we found similar results. We know who the rockstars are and who are lagging, but most importantly, we know who is purchasing their likes and engagement. 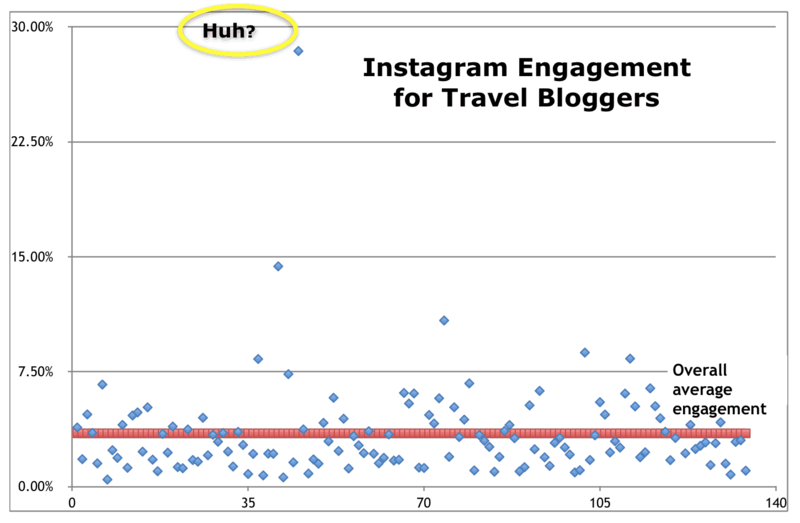 And one of several ways we do that is by spotting the “engagement outliers”. You can see that most of the influencers cluster between 2% and 7.5% engagement, with a few notable outliers: the most surprising being the point at the top of this graph near the 30% engagement line. “Engagement” is what we are all striving for, so that is good, right? 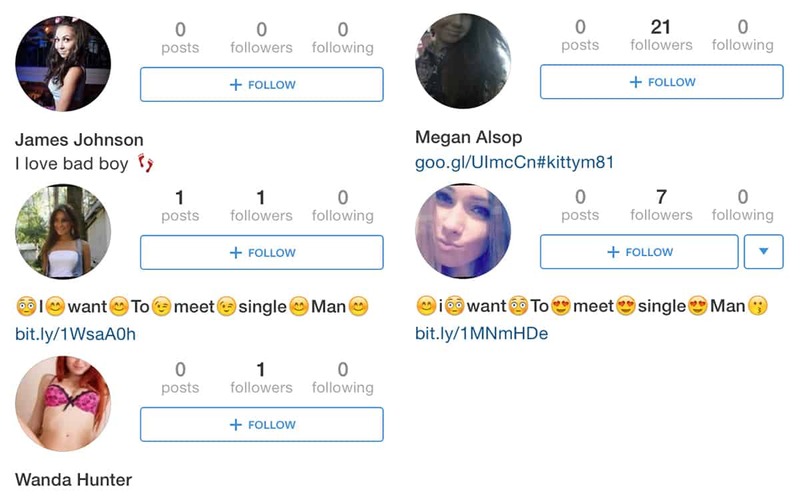 Blank accounts such as these are a strong indicator that this engagement was purchased. (Just google buy instagram likes to see how easily this is done.) Sure, all of those “likes” on a photo may look impressive, but in this case, there are no real people behind those fake accounts allegedly “liking” a photo. That is completely empty engagement and worthless to any brand or destination looking to reach an influencer’s audience. If it’s fake, it’s worthless. But sadly, that is not the only way to manipulate the system. Illegitimate followers are one thing, but there are other things going on behind the scenes that can be harder to detect. Another way to test: if you are interested in working with one particular influencer on Instagram, stalk them closely for a few days. Set it so that you get notifications for every photo they post. And then, when you see them posting, watch immediately to see who the first few people are who like the photo. If it is the same people every time, then they are likely a part of a bot service that automatically likes and/or comments on other accounts so that they can get the same automated engagement in return. It constitutes as engagement from legit accounts, but still invalid. That photo was liked unseen. That like is no longer a testament to the influencer’s ability to engage with their audience or effectively promote a product or destination for their client. Want to keep digging? Yes, there are even more ways to test an Instagrammer’s audience for legitimacy. But we aren’t about to give away all of our secrets. Testing audiences can be a lot of work. But you need to know where your marketing dollars are going. Reporting a high rate of engagement on your influencer of choice may look good to the bosses above you, but if that doesn’t translate into true engagement, and effectively, bookings or sales, then the effect is lost. Want to know more? We’ve written an entire ebook about how to find the right influencers to work for you, and to set up your campaigns for success. Go here for your free download.